When you’re looking at waterfowl hunting properties for sale in Northern California, it’s good to know what land characteristics to watch for. Waterfowl are plentiful in Northern California–you just need the right habitat to draw them. First and foremost, waterfowl need a habitat that feels safe. Like many animals in the wild, ducks and other fowl are sensitive to people, pets, vehicles, roads, and buildings and will tend to stay away if any of these are in close proximity. Make sure the wetland or pond–where waterfowl love to feed–is in an isolated area, away from noises and disturbances. Ideally, this area should be on the flyway in hopes of attracting more fowl. Feeding areas should also be surrounded by open ground, since that will discourage predators–such as foxes, coyotes, raccoons, opossums, and snapping turtles–from being able to prey on them. It’s even better if there is a visual barrier at a distance that keeps predators from being able to see or access the waterfowl. Waterfowl hunting properties for sale may boast of water on the property, but you will want to find out how deep the water is. Waterfowl love wetlands or shallow ponds that have gently sloping edges and are surrounded by inviting grasses and plants. Ducks and geese are also drawn to trees or logs in flooded areas. Along with grasses and plants, these provide perfect places for them to roost, nest, or find cover. Japanese honeysuckle draws deer, but isn’t as appealing to ducks. 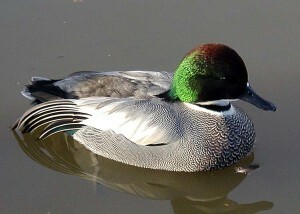 It can quickly take over and make access to the water difficult for ducks. If your main focus for the land is going to be waterfowl, then it’s best to choose a property that isn’t overtaken by Japanese honeysuckle. Ducks and other waterfowl have an omnivorous diet–meaning they eat both plants and animals. They dine on amphibians, small fish, invertebrates, grasses, weeds, algae, aquatic plants, seeds, grains, berries, nuts, and fruits. A plentiful supply of these food stores in and around the wetland or pond will draw many happy ducks and geese. If the property you’re considering has all the makings of being a great waterfowl hunting property, but doesn’t have any water, or has water, but not the marshy lowlands that ducks and geese love, you can create a habitat that draws them. Determine whether there’s an isolated area that you could transform. When you’re looking at waterfowl hunting properties for sale in Northern California, look for the right location, the right amount of water, and the right kinds of food that will appeal to waterfowl. Buying a duck-ready habitat is easier than trying to create one.